Compass & Anvil offers state-of-the-art CAD/CAM software to create 3-D surface models to ensure exact specifications that meet client needs. 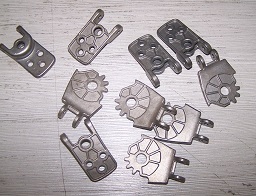 Investment casting or precision investment casting is one of the oldest recognized techniques of metal forming. The process can involve using a wax model as the mold, or by using the model to create a copy that could be used for future molds. Pattern Creation - Using specialized waxes or other refractory materials, an original pattern is created for the components that are to be generated. Mold Creation - The pattern is used to create a master mold (or die) that includes a gating system to allow molten metal to be poured into the pattern elements. The mold is usually made by coating the wax (or other material) pattern with a ceramic or metal shell and then melting out the original pattern, leaving a durable shell. Pouring - Molten metal is poured through the gating system and into the mold, and then allowed to cool and solidify. Removal - Once metal has cooled, the mold can be broken and the gating segments removed. Finishing - The casting is finished to product specifications using a number of methods, including heat treatment, grinding, polishing, or sandblasting. Precision investment casting provides a variety of benefits, including product consistency and accuracy with close tolerances. The process also allows for a high level of versatility in creating parts that are challenging to manufacture using other forming methods. Contact us today at (408) 205-1319 (Pacific Time) or email us for a no obligation quote or to request additional information about precision investment casting.